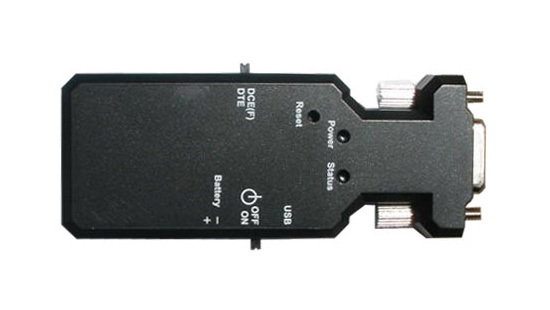 If you need to communicate with a RS232 serial device but don't want to use cables, then you can use this serial Bluetooth adapter to create a rock-solid and secure wireless communication link for up to 300 feet. A wireless link can be created between a computer and a single serial device or between a computer and multiple serial devices or, since this serial Bluetooth adapter does not require drivers, you can even setup a link between two or more serial devices, without using a computer. See our setup examples for the serial Bluetooth adapter. Another great feature of this serial Bluetooth adapter is that you can connect to it with built-in Bluetooth or if your computer/device does not have built-in Bluetooth you can connect to it by using a standard external USB Bluetooth dongle. Either way the setup procedure is easy with Windows 7's built-in management software or any third-party Bluetooth management software such as BlueSoleil or Toshiba BT Stack. If you pair two serial Bluetooth adapters directly with each other then no Bluetooth management software is needed. This is also referred to as a direct wireless cable replacement. This serial Bluetooth adapter has several power options. It can be powered by either the included USB cable, but it can also be powered by an external mini USB power supply. Alternatively this adapter can be powered by an external 3.7 - 5.0V battery. Battery connection cable is included, but the battery is not included. 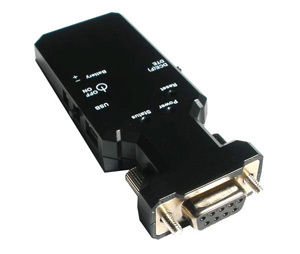 Finally this adapter can also be powered through pin 9 at the serial DB9 connector. A large number of parameters such as baud rate, data bits, security, master/slave settings, flow, PIN and many other parameters can be adjusted to suit your needs. Please see the datasheet for all parameters. DTE/DCE is set by a slide switch on the side of the adapter. The parameters are programmed by standard AT commands with a terminal program such as Hyper Terminal or TeraTerm however a nice feature is that by enabling a specific parameter this adapter can also be programmed via Bluetooth. 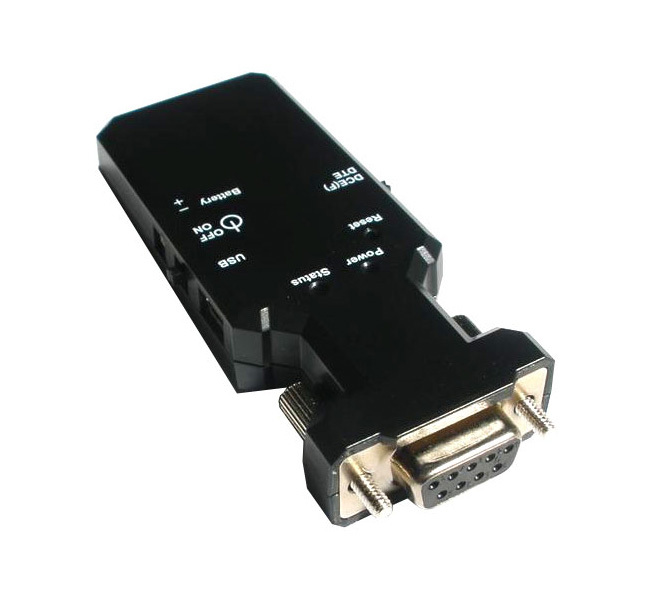 You can use this serial Bluetooth adapter with the majority of serial devices, as long as the serial device supports the SPP (Serial Port Profile) profile. Most industrial and commercial serial devices such as CNC machines, PLC's, manufacturing machinery, scales, scanners and printers support this profile. Operating system Windows 10, 8, Windows 7, Vista, XP, 2000, 98, Linux, Mac.